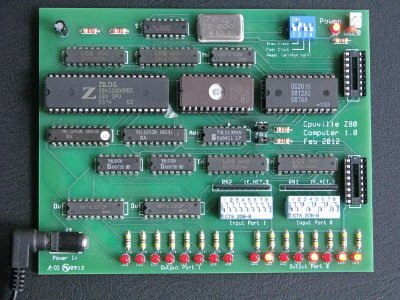 This is the original Z80 computer kit. It consists of a printed circuit board, and all the parts to a assemble a small 8-bit computer system. It is intended as an educational project, and should not be used as a controller for any machinery or processes that might result in harm if the computer fails. 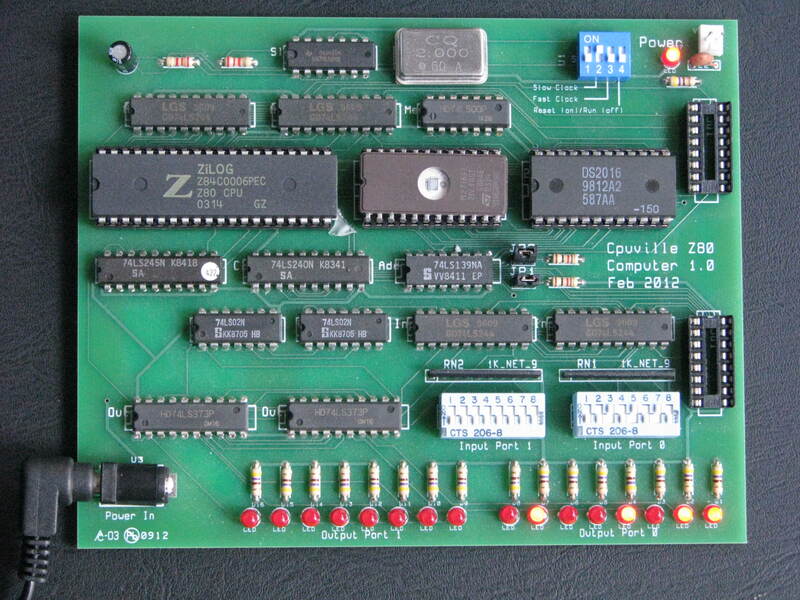 It has the Z80 processor, 2K EPROM, 2K RAM, two input ports, and two output ports. It comes with the 2K EPROM pre-programmed with a set of programs that allow you to test the computer, and to load and execute small programs. There is additional code in the EPROM to run the serial interface. A complete listing of the EPROM can be found in the computer kit instructions on page 66. An optional EPROM with Palo Alto Tiny BASIC is available. The Tiny BASIC manual is here. This computer has two clock speeds. The slow clock runs at a few cycles per second. This is slow enough that you can see the activity of the computer system buses if you have the computer bus display attached. The fast clock runs at 2 MHz, which is the more normal clock speed for a Z80. To assemble the kit, you will need solder, a 15- or 30-watt soldering iron, and some simple tools. It can probably be built by a careful, determined novice, but there are over 500 connections to be made, so it might be better if you have had some soldering experience. You can get some experience building the simple logic probe kit followed by the display kit. There are details about building the computer kit, bus display, and logic probe kits in the computer kit instructions.